Anybody who sees Ayo Fayose, the so-called governor of Ekiti State should please beg him to see a psychiatric doctor before it is too late. From the look of things now, I do not know if the man ever sleeps at all. From the look of things I can say authoritatively that he wakes up in the dead of the night to cry and curse the day General Buhari was born. I am sure he has fallen out with everybody; his siblings and members of his family included because of this Buhari factor. 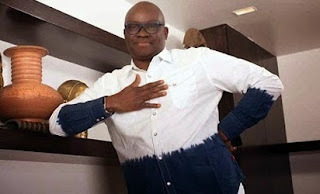 After robbing former Governor Fayemi of Ekiti State, Fayose has been on top of the world celebrating his so-called victory until the bubble burst. When the results of the June 21 Ekiti guber elections was made public I remember I told anybody who cared to listen that APC must find out what went wrong before it happens in other APC States. When the elections shifted to Osun State, APC knew that it had to stand up or PDP will get bolder and repeat the same onslaught. APC took the bull by the horns and the rest is now history. Now almost seven months after, the sordid story of what took place in Ekiti began to emerge. It took the well-respected online publishing company, Sahara Reporters, to unravel what went wrong in Ekiti State. Nigeria and the world was shown the audio recording of how Ayo Fayose, Musliu Obanikoro, Chris Ubah, Iyiola Omisore, Police Affairs Minister, Jelili Adesiyan, Brigadier General Momoh and many others conspired to rob former Governor Fayemi at gun point. Ayo Fayose, Jelili, Obanikoro have since acknowledged their presence at the meeting but still denying the obvious and painful truth that they ordered the police and military personnel around and used them extensively to steal Ekiti State at gun point. But the worst hit in this criminality and brigandage is the man Ayo Fayose. Never in the history of this country have we seen this type of abuse of the military in a civilian dispensation by a bloody civilian. Ever since General Buhari emerged the candidate of APC and the events that have followed his emergence, Ayo Fayose has been a ghost of himself. He fears Buhari more than anything under the sun. Even though Buhari is yet to win the Presidential elections slated for February 14 2015 and now shifted to March 28 2015, Ayo Fayose will not sleep. He fears even his shadow and even a knock at the door by his siblings, his aides and neighbours. For Ayo Fayose, the fear of Buhari is now the beginning of wisdom. This is the reason he wants General Buhari dead by all means. Fayose once bought the front pages of the Punch and Sun Newspapers not only to pass a death sentence on Buhari because the man is 72, he used the same medium to mock dead leaders from a section of the country. Fayose nearly provoked an ethnic war in the country but the situation was managed by leaders across Nigeria who rose in their thousands to condemn Fayose without mincing words. But Fayose will not listen. Soon Fayose started the campaigns that Buhari is sick. He has been trailing the APC Presidential candidate anywhere he goes. He has been monitoring the man’s movement anywhere he goes. Buhari travelled to London and Fayose followed him to London claiming that GMB has gone for treatment. Now can’t Buhari go for medical check-up like every other Nigerian of his status? Can’t Buhari go for treatment just like any other Nigerian of his caliber? What is wrong in anybody going for medical check-up or treatment? When has it become an offence for prominent leaders to go for check-up? Today in all the papers and everywhere on the internet, the mentally retarded Fayose says, BUHARI CAN NEVER RULE NIGERIA. Now who is Ayo Fayose in Nigeria that will stop candidate Buhari? Where is his capacity and capability to stop this movement? Who is behind this loose cannon? Who is beating the drum for this naked dancer? Of what meat is Ayo Fayose fed? I know that a million Ayo Fayoses cannot stop Buhari from being sworn in as president in May 29 2015. I know Fayose is playing to the gallery. I know Fayose is being tormented by his past. Fayose has two murder cases hanging on his neck. Fayose has used thugs to attack a High Court Judge. Fayose has abused the State Assembly in Ekiti State. Fayose has abused and frustrated the Speaker by using five members of the House to impeach him. Fayose has used five members to screen his Commissioners. Fayose has passed the 2015 Budget with five members of the House of Assembly out of 26 members. Power has turned Fayose to something else that he no longer thinks. Soon Fayose will be called to come and give an account of his open criminality and brigandage in Ekiti. Buhari will bring Fayose to judgment in the fullness of time. The world is now seeing why Jonathan must go for Nigeria to breathe fresh air. Fayose knows that the moment General Buhari wins this election he has to run away from Nigeria. He knows that he is sitting on a stolen mandate. He knows that he needs nobody to advise him on what to do the moment it becomes obvious that Buhari is the next president of Nigeria. A thief runs when nobody is pursuing him. Glo-CAF Awards 2015: Pierre-Emerick Aubameyang crowned African Footballer of the Year.